Each bank comes bubble-wrapped in a colorful, instructive box with a sheet of goal setting stickers to help kids stay focused on their money choice goals. A parent/child brochure with easy-to-follow instructions and tips for each of the four money choices is also included with each bank. It's money management for the 21st century. 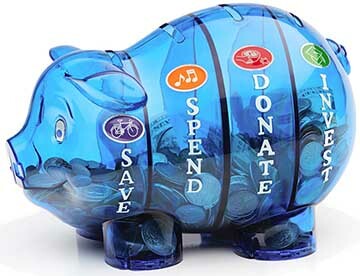 The patented Money Savvy Pig piggy bank has four chambers for each of the four money management choices: Save, Spend, Donate and Invest. Each chamber empties easily and individually through a different foot. Red available only by special order. Click here to download a customer safe version of this page in PDF format. 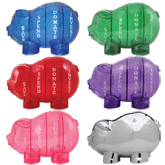 Click here for a customer safe version of the Platinum Edition Money Savvy Pig in PDF format. P.S. Don't forget to order the Money Savvy Kids™ Family Activity & Coloring Book. It's a great companion piece! © 2019 SavvyPromo. All rights reserved.